MCHINJI-(MaraviPost)-The visiting Foundation for a Smoke-free World through Agriculture Transformation Initiative (ATI) on Monday donated US$250,000 (MK18 million) to Central Region Milk Producers Association (CREMPA) to boost their production. The funds will directly benefit over 220 dairy farmers at Chiopsa Milk Bulking centre, Kamwendo in the boarder district of Mchinji. The visiting Foundation for a Smoke Free World President Dr. Derek Yach, Jim Lutzweiler Agriculture and Livelihoods’ vice president and Malawi’s ATI officials unveiled the package to farmers. The packages is expected to formalize dairy farmers operation on ATI project of providing alternatives to tobacco since its establishment in September this year in Malawi. Foundation for a Smoke Free World President Dr Yach told reporters after the donation that it was the wish of the organization that dairy farmers embrace other source of income alternatives to tobacco. Dr Yach observed that tobacco farming is declining due to anti-smoking campaign across the global hence the need for farmers to revitalize other alternatives. “We expect farmers to embrace other income alternatives including dairy farming which has potential to realize their livelihoods dreams. Tobacco farming is risky business now due to Ant-smoking campaign which once is fully operationalize, farmers will be left with nothing hence the initiative”, says Dr Yach. ATI Malawi Country Director Dr. Candida Nakhumwa disclosed the program will be expanded to other tobacco farming districts. Dr. Nakhumwa urges farmers to make use of resources provided that their production be improved for their livelihoods. 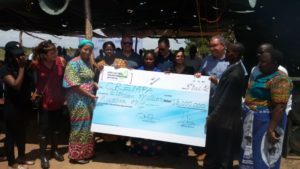 CREMPA General Manager Dr. Charles Ndlovu lauded ATI for the timely donation saying the funds will help in operationalize the association’s activities where over 5640 farmers are expected to benefit. One of Chiopsa Milk Bulking centre farmers, Joana Daniel expressed gratitude over the funds saying will help them on mobility. Joana expects her milk production to increase while urging dairy companies to raise buying price from the current MK170 per litre to MK250 per litre for improvement of their livelihood. She disclosed that dairy farming has transformed her family income as she is able to send children to schools.